杜媛鲲, 赵永波, 米源, 陈阁, 廖海江, 王雷. 小干扰RNA下调PLK1表达对食管腺癌细胞肿瘤生物学行为的影响[J]. 中国医科大学学报, 2018, 47(10): 905-908, 913. DU Yuankun, ZHAO Yongbo, MI Yuan, CHEN Ge, LIAO Haijiang, WANG Lei. Silencing PLK1 with Small Interfering RNA Modulates the Biologic Behavior of Esophageal Adenocarcinoma[J]. Journal of China Medical University, 2018, 47(10): 905-908, 913. Abstract: Objective To explore the effect of downregulation of polo-like kinase 1 (PLK1)expression on the growth and invasion of esophageal adenocarcinoma OE33 cells and the underlying molecular mechanism. 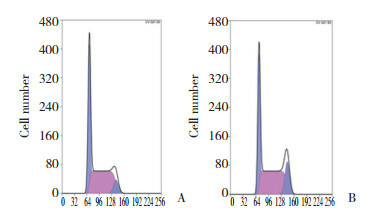 Methods PLK1 small interfering RNA (siRNA)and negative control siRNA were each transfected into OE33 cells for 48 h. The expression of PLK1 mRNA was detected by real-time, fluorescence quantitative PCR. 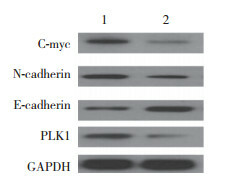 The expression of proteins PLK1, E-cadherin, N-cadherin, and C-myc were detected by Western blotting. The cell cycle was determined using flow cytometry. In addition, the invasive ability of the cells was detected by Transwell assay. Results Inhibition of PLK1 mRNA and protein expression by PLK1 siRNA downregulated the expression of C-myc and stopped the cell cycle in the G2/M phase. At the same time, reduced expression of N-cadherin and upregulated expression of E-cadherin reduced the invasive ability of the cells in a statistically significant way, compared to control siRNA (P < 0.01). Conclusion PLK1 may play an orchestral role in the growth and invasion of esophageal adenocarcinoma. PLK1 knockdown can inhibit cell mitosis and invasion. CAI XP, CHEN LD, SONG HB, et al. PLK1 promotes epithelial-mesenchymal transition and metastasis of gastric carcinoma cells[J]. Am J Transl Res, 2016, 8(10): 4172-4183.